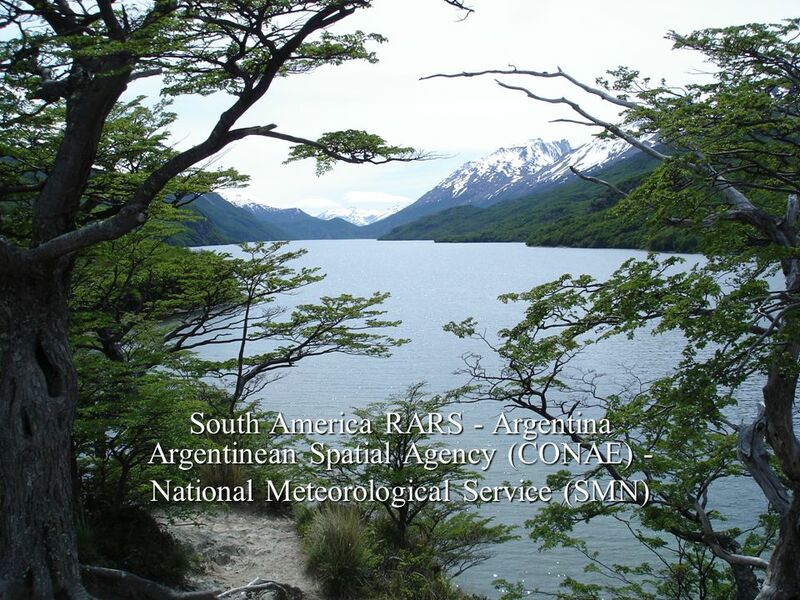 Comisión Nacional de Actividades Espaciales Exeter, October 2012 RARS IG - 6 Servicio Meteorológico Nacional South America RARS - Argentina Argentinean. 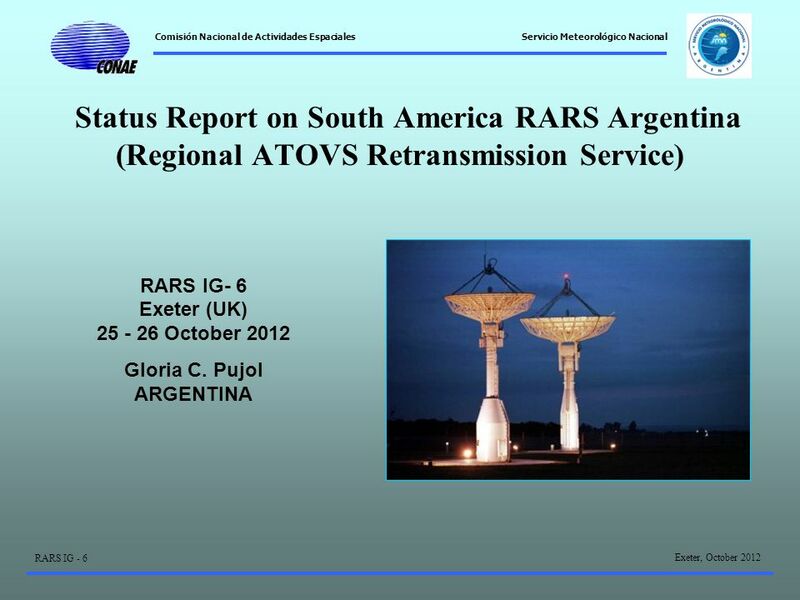 4 Comisión Nacional de Actividades Espaciales Exeter, October 2012 RARS IG - 6 Servicio Meteorológico Nacional May 2008 started operational, as main node of the Argentinean Component for South America RARS. AAPP version 6.15 and Bufr encoder 3.83 are running. 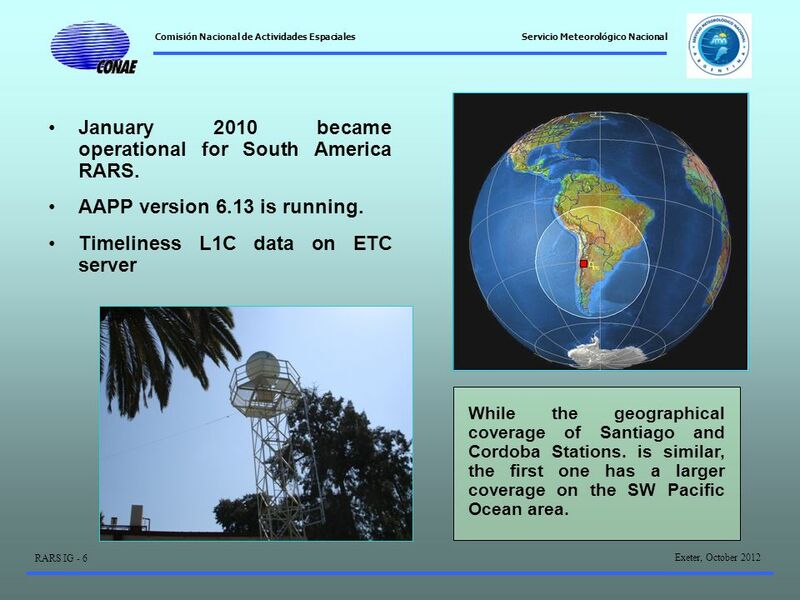 ATOVS L1C from Cordoba, Marambio and Santiago de Chile stations are collected. 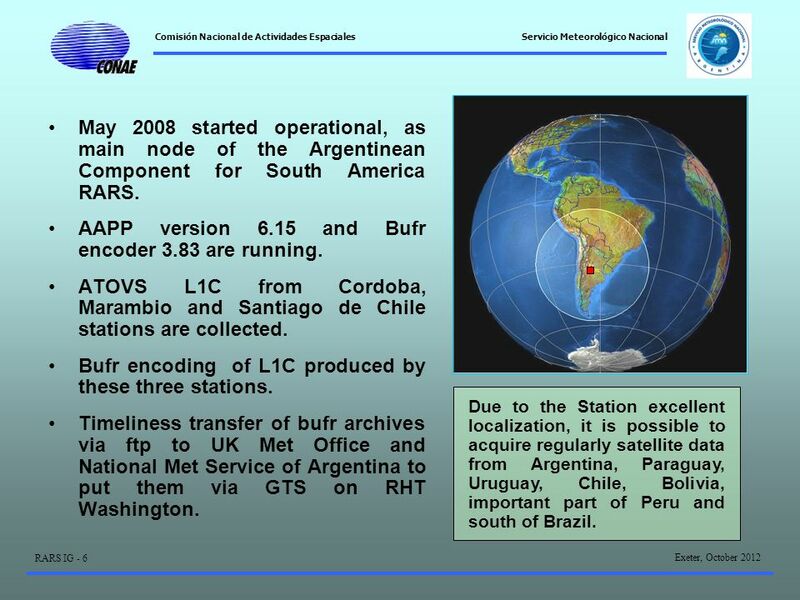 Bufr encoding of L1C produced by these three stations. 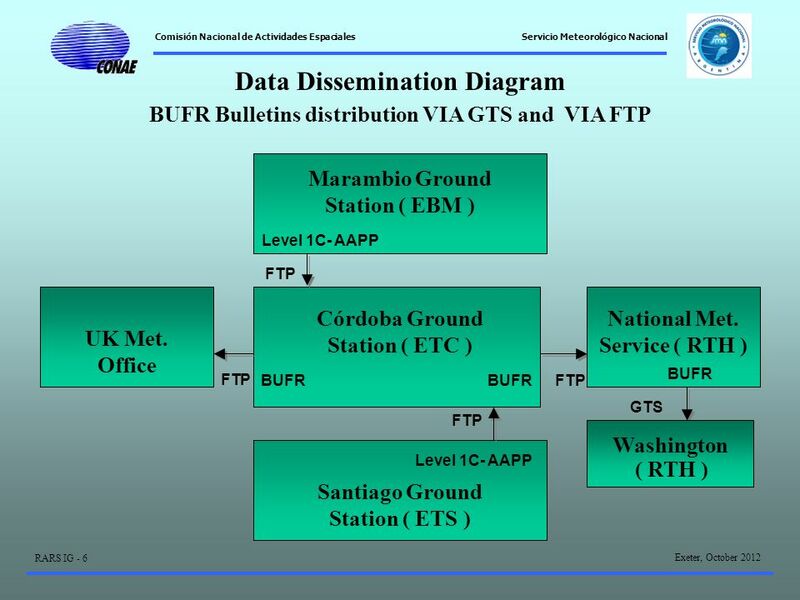 Timeliness transfer of bufr archives via ftp to UK Met Office and National Met Service of Argentina to put them via GTS on RHT Washington. 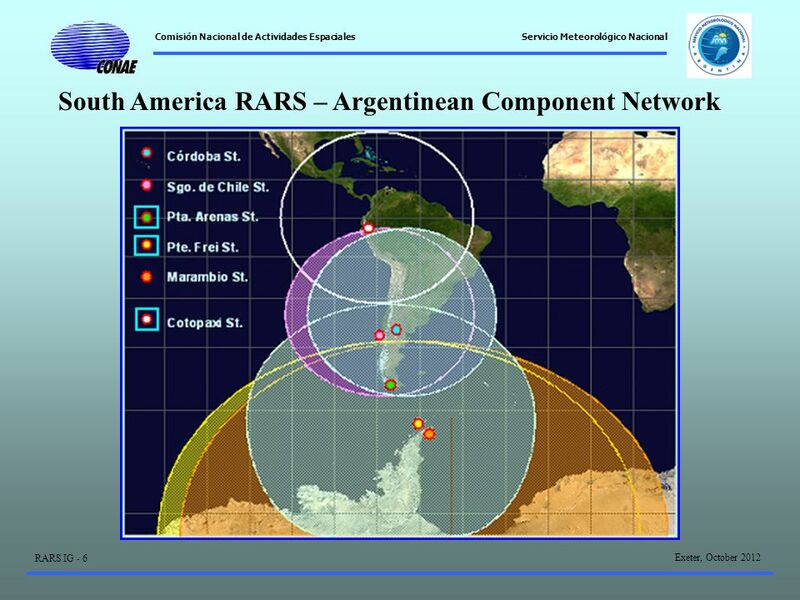 Due to the Station excellent localization, it is possible to acquire regularly satellite data from Argentina, Paraguay, Uruguay, Chile, Bolivia, important part of Peru and south of Brazil. 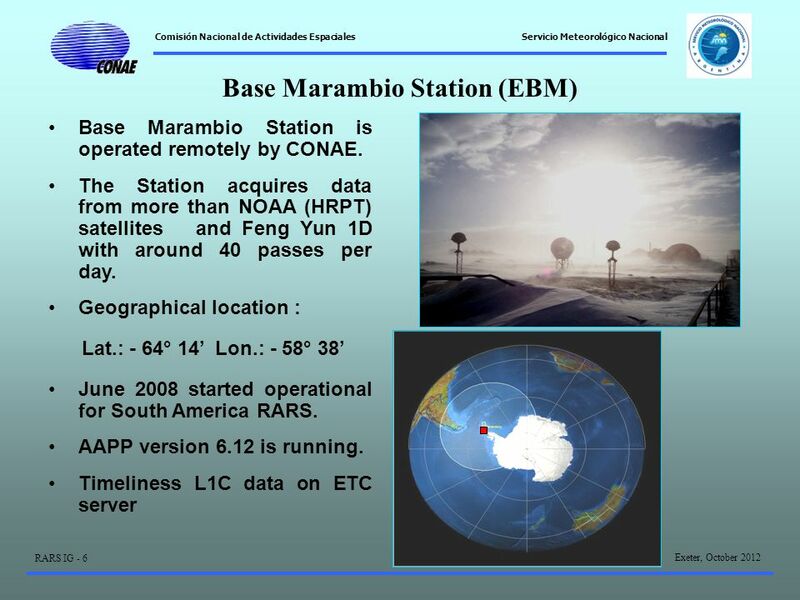 17 Comisión Nacional de Actividades Espaciales Exeter, October 2012 RARS IG - 6 Servicio Meteorológico Nacional Base Marambio Station (EBM) in Antarctica Since 7th June 2010 to present is out of service. 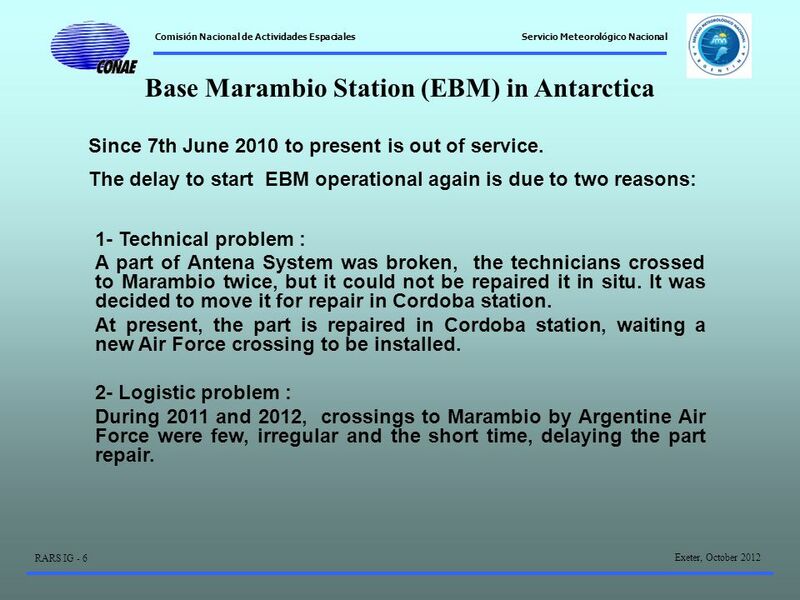 The delay to start EBM operational again is due to two reasons: 1- Technical problem : A part of Antena System was broken, the technicians crossed to Marambio twice, but it could not be repaired it in situ. It was decided to move it for repair in Cordoba station. 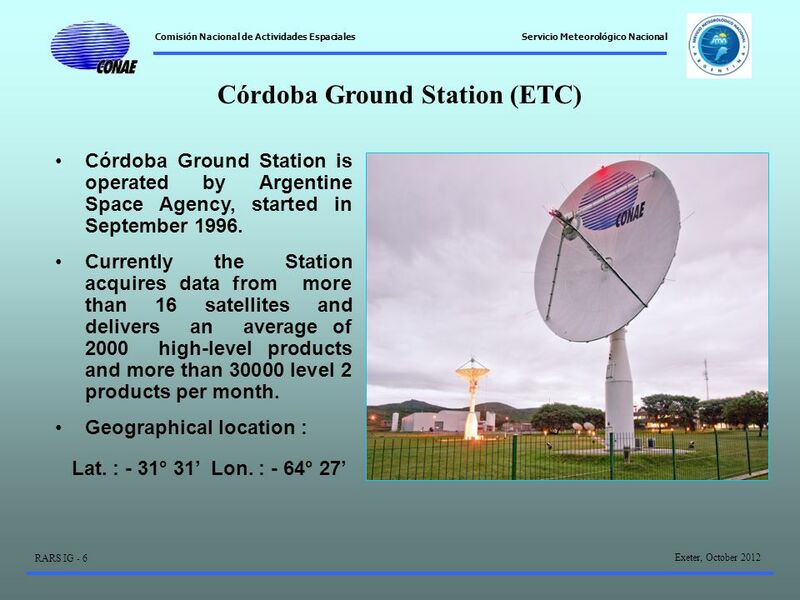 At present, the part is repaired in Cordoba station, waiting a new Air Force crossing to be installed. 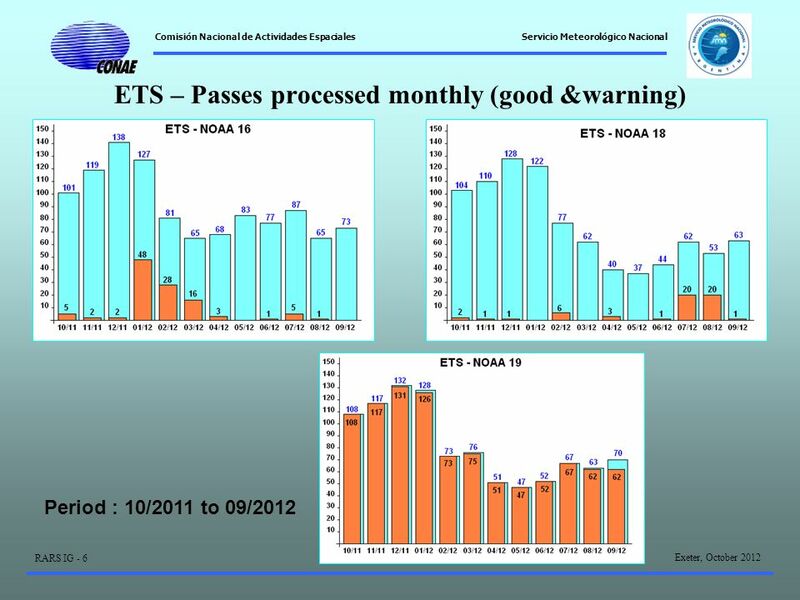 2- Logistic problem : During 2011 and 2012, crossings to Marambio by Argentine Air Force were few, irregular and the short time, delaying the part repair. 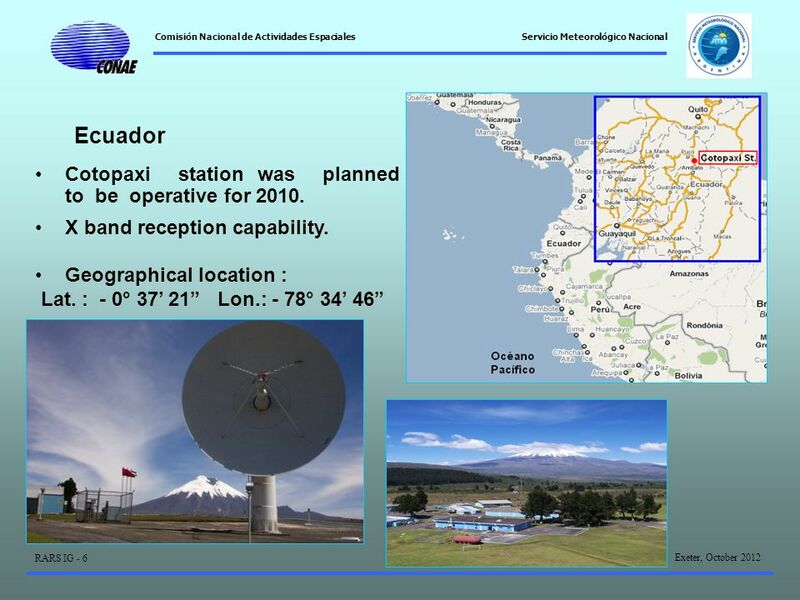 21 Comisión Nacional de Actividades Espaciales Exeter, October 2012 RARS IG - 6 Servicio Meteorológico Nacional Cotopaxi station was planned to be operative for 2010, but despite the efforts made, this has not been possible, basically the technical problems are follows: 1- Ingesting system is very old: runs on DOS. 2- Memory and network management: the system is unable to ingest data and connect to the network for processing data in other machine at the same time. 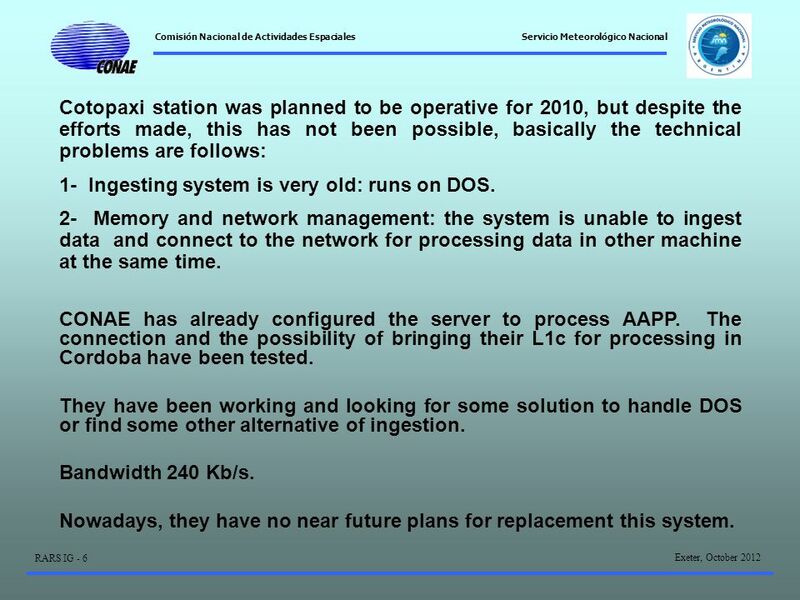 CONAE has already configured the server to process AAPP. 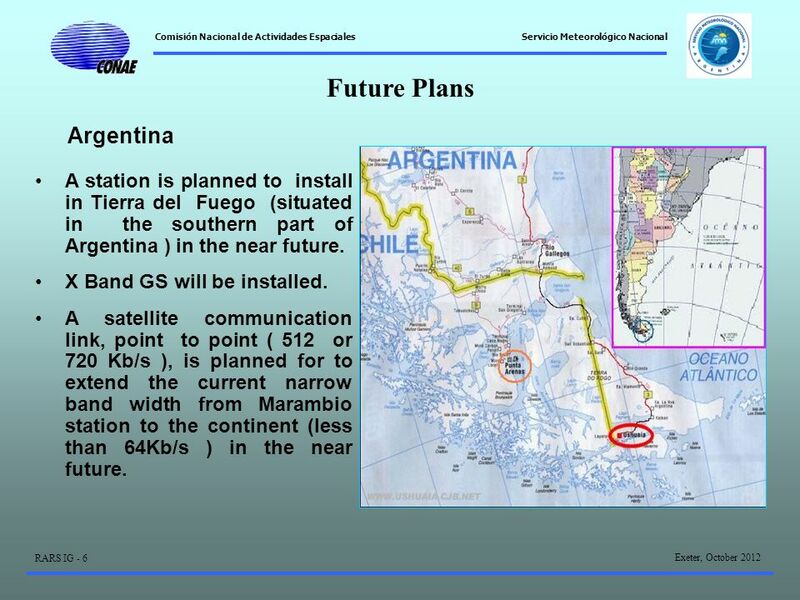 The connection and the possibility of bringing their L1c for processing in Cordoba have been tested. 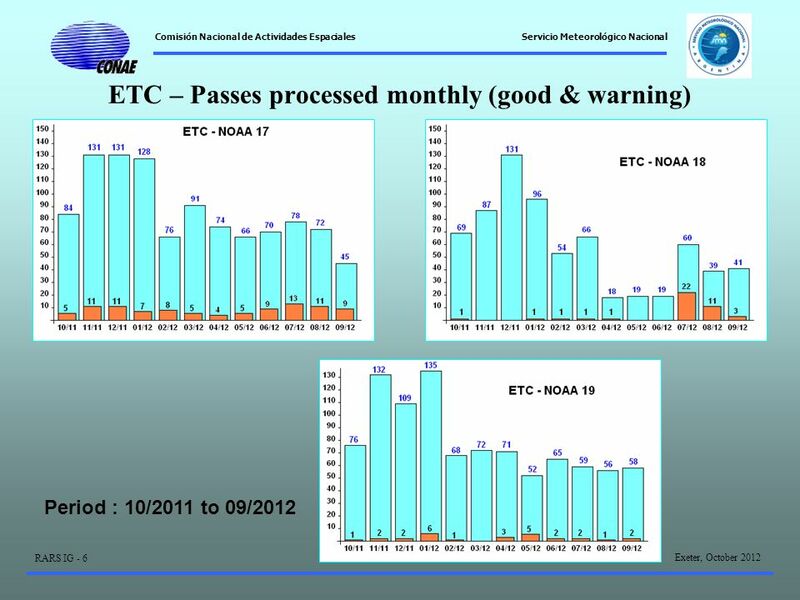 They have been working and looking for some solution to handle DOS or find some other alternative of ingestion. Bandwidth 240 Kb/s. Nowadays, they have no near future plans for replacement this system. 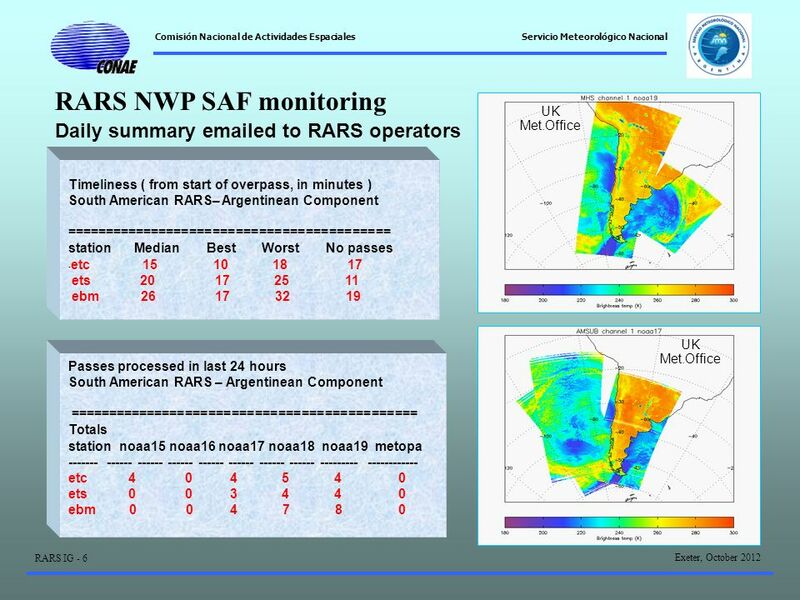 22 Comisión Nacional de Actividades Espaciales Exeter, October 2012 RARS IG - 6 Servicio Meteorológico Nacional Cordoba Station : On going actions NPP and METOP-B NPP CONAE will perform an upgrade on the Ground segment in order to be able to acquire and process NPP. 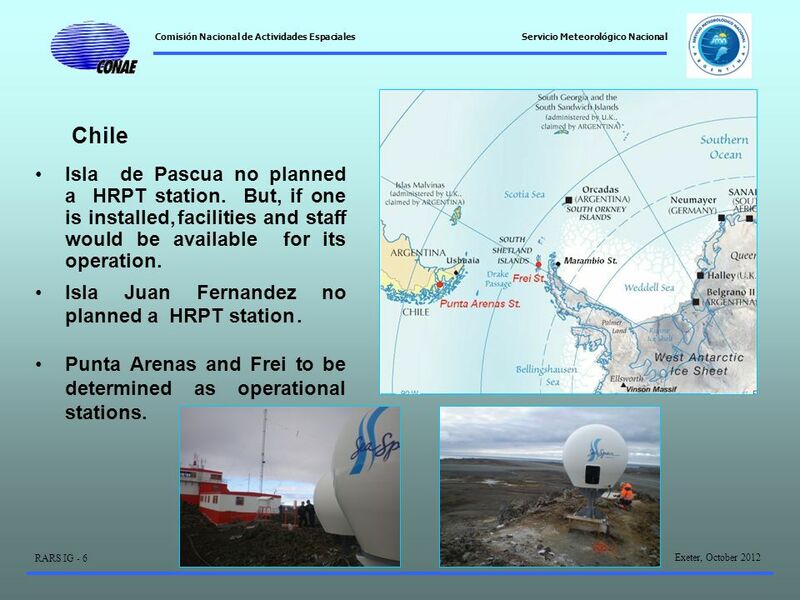 The Upgrade implies a current CONAE Antenna retrofit to fulfill the Mission Requirements (new Radio Frequency elements will be integrated). Purchase Order has been already delivered. Deadline for this activity April 2013. 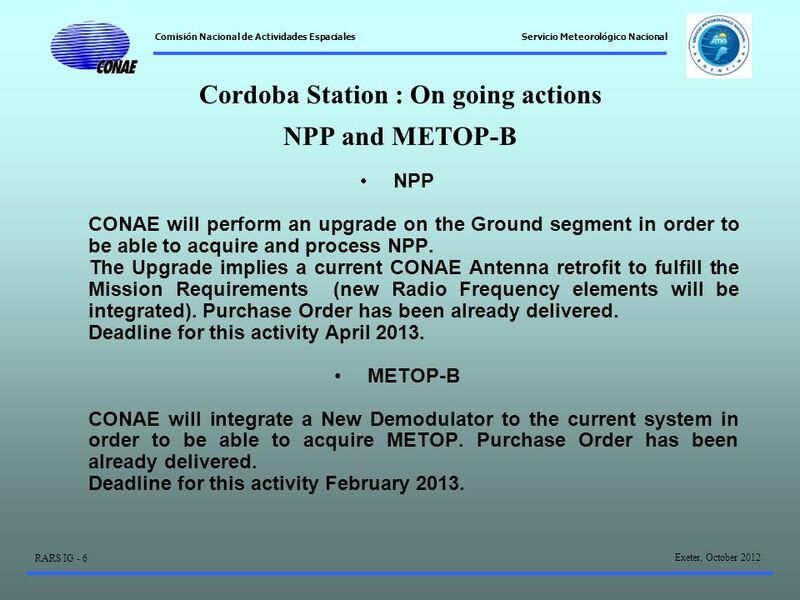 METOP-B CONAE will integrate a New Demodulator to the current system in order to be able to acquire METOP. Purchase Order has been already delivered. 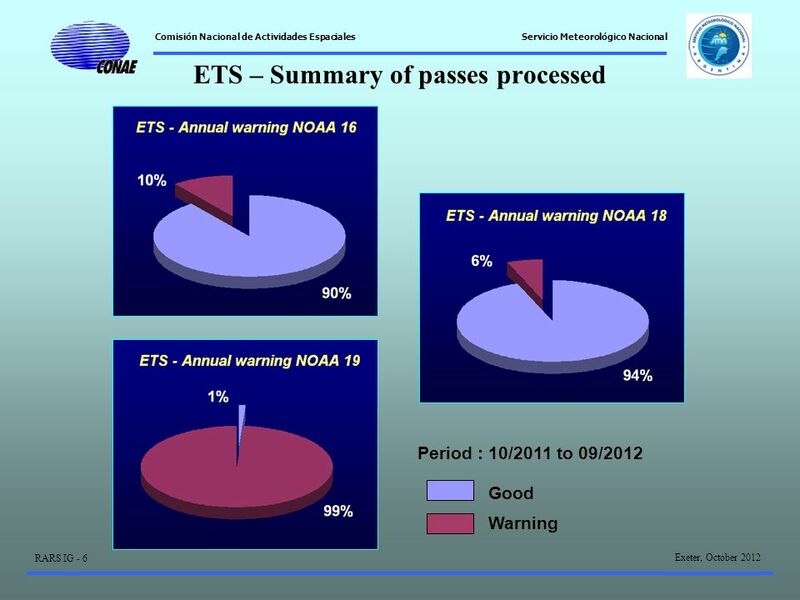 Deadline for this activity February 2013. 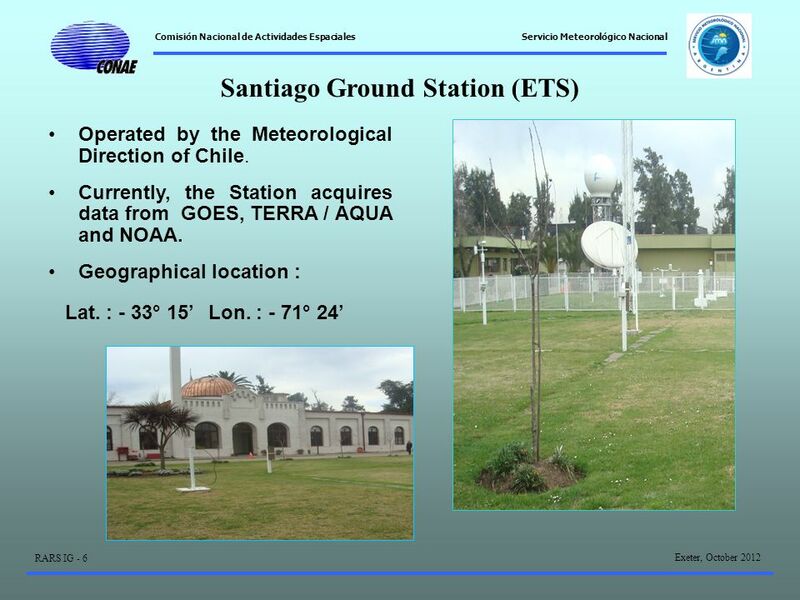 23 Comisión Nacional de Actividades Espaciales Exeter, October 2012 RARS IG - 6 Servicio Meteorológico Nacional Santiago Station : On going actions NPP and METOP-B NPP Meteorological Direction of Chile (DMC) together with the Photogrammetric Air Service of Chilean Air Force requested budget from SeaSpace for purchasing/upgrading the equipments and antenna for the NPP reception. 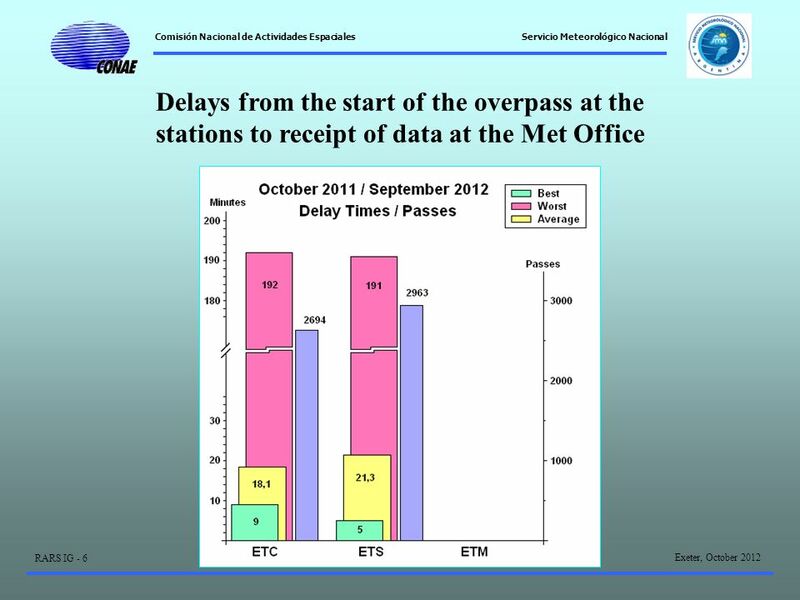 This action is planned for 2014 depending on the allocation of funds. 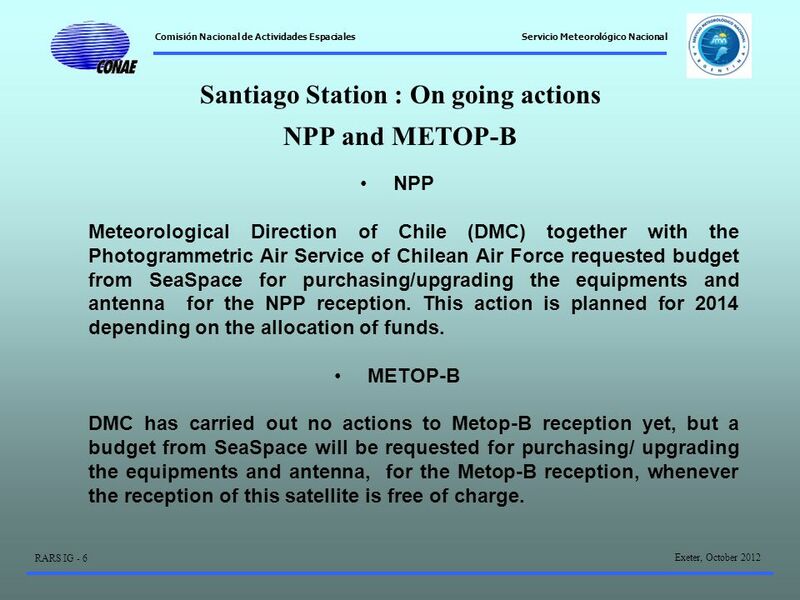 METOP-B DMC has carried out no actions to Metop-B reception yet, but a budget from SeaSpace will be requested for purchasing/ upgrading the equipments and antenna, for the Metop-B reception, whenever the reception of this satellite is free of charge. 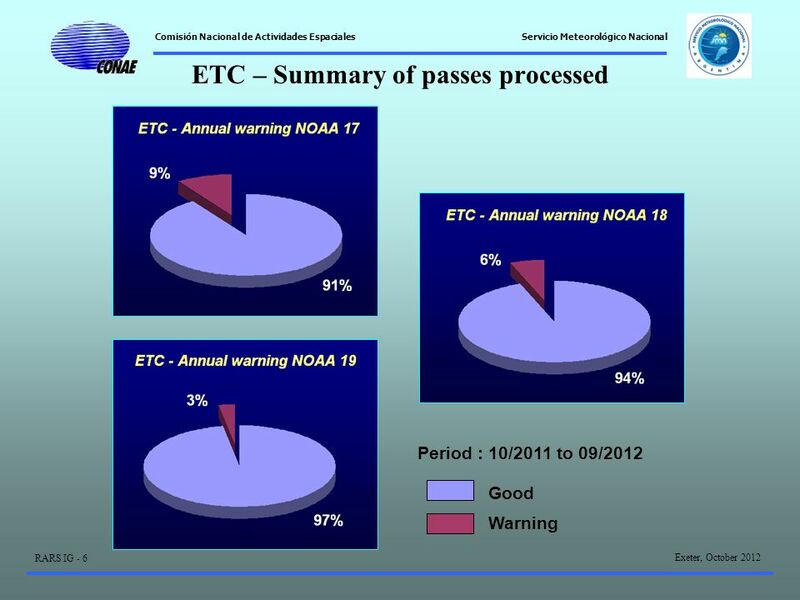 24 Comisión Nacional de Actividades Espaciales Exeter, October 2012 RARS IG - 6 Servicio Meteorológico Nacional Lic. 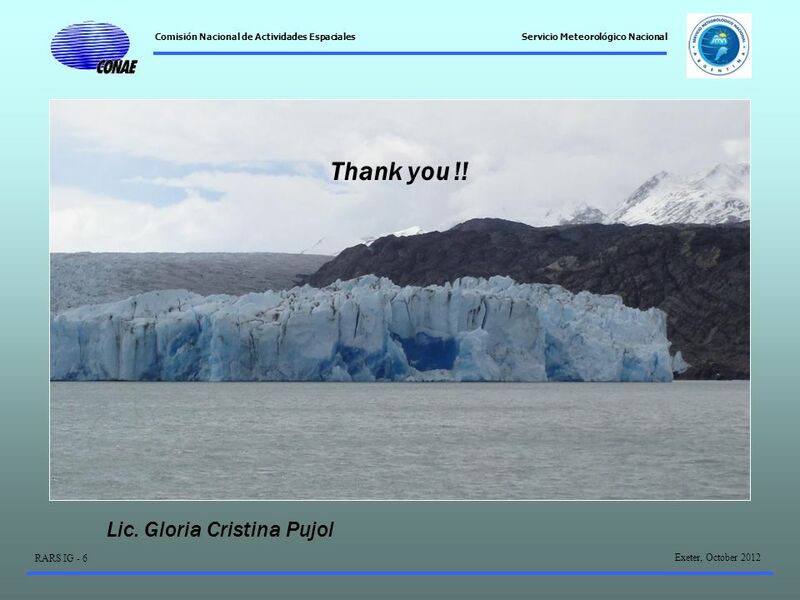 Gloria Cristina Pujol Thank you !! 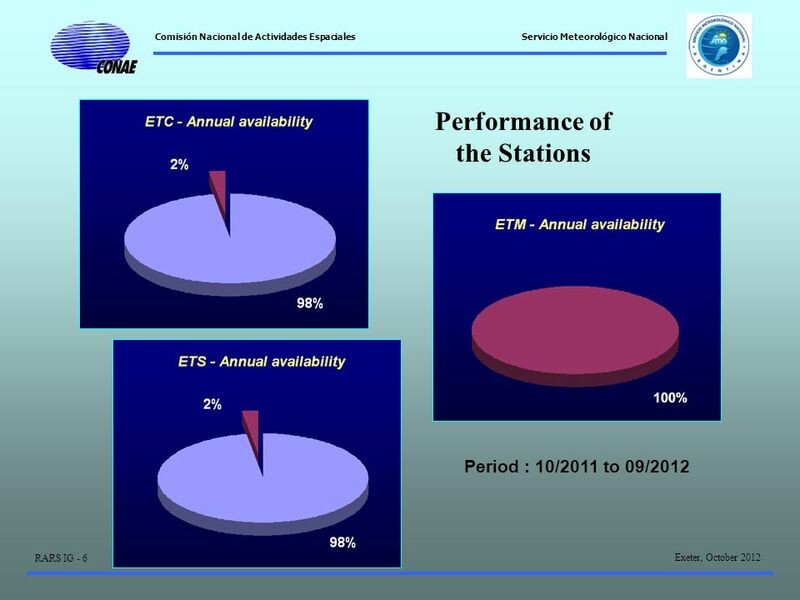 Download ppt "Comisión Nacional de Actividades Espaciales Exeter, October 2012 RARS IG - 6 Servicio Meteorológico Nacional South America RARS - Argentina Argentinean."